Michael Dell, founder of Dell Technologies, was right on his statement about the cloud, and the same can be said of cloud native. Spontaneously, you wouldn’t think that something with the word cloud in it can be applied on-premise as well as in a cloud, but it can. Cloud native is more than a specific place or technology, it’s a way of developing, deploying and managing applications. Enterprises need to understand this, and if they don’t, they will miss out on much of the value that cloud native has to offer, and the transition to the cloud will become harder. “Cloud native technologies empower organizations to build and run scalable applications in modern, dynamic environments such as public, private, and hybrid clouds. Containers, service meshes, microservices, immutable infrastructure, and declarative APIs exemplify this approach. 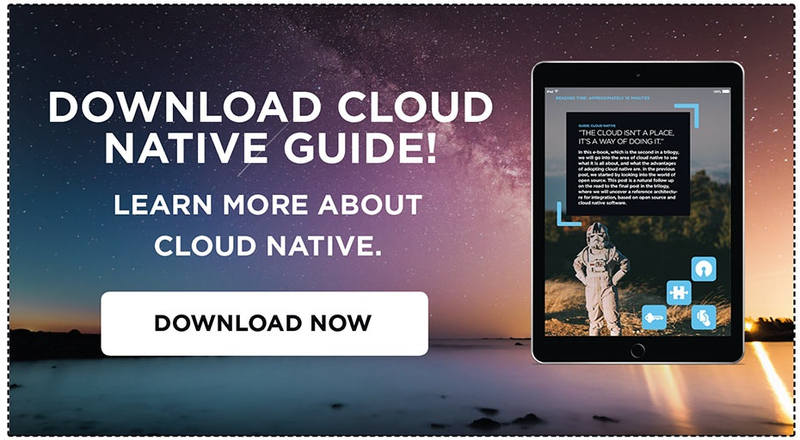 In this guide, which is the second one in a trilogy, we will go into the area of cloud native to see what it’s all about, and what the advantages and challenges of adopting cloud native are. We will also take a look at the current state of cloud native, and make some predictions for 2019. In the previous guide, we started by looking into the world of open source. This guide is a natural follow up on the road to the final guide in the trilogy, where we will uncover a reference architecture for integration, based on open source and cloud native software.